Like a sprained ankle, Njoki Chege ain't nothing to play with. She has been on fire for the last couple of days. I think 'moto wa kuotea mbali' should be her anthem and Grandpa should hurry to 'ita wazima moto' because at this rate.........shhhhh, keep the fire burning. Unlike most of my friends, I am a huge fan of Kenyan radio. I listen to local radio whenever I can, which is mostly on my way to work or school. 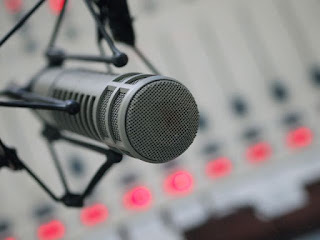 Mention a radio station and I will give you a list of my favourite presenters, their shows and what time they are on air. Which is why I feel that I am an authority in the field of a local radio. And who is better placed to give advice to future radio presenters on how to be a radio presenter in Kenya? You guessed it. So here we go, boys and girls who envision a bright future in the world of local radio. Do you want to be a radio presenter in Kenya? Do you think you have what it takes? Look no further. I got you. Grab a pen and a notebook; I am only going to say this once. 1. Have a fake accent: A fake accent is the capital requirement for a sterling career in radio. in your mother tongue). It won’t even matter if you are that short, male radio presenter who easily sings like a girl and dresses in cleavage revealing t-shirts. Are you a failing musician? Report to the nearest radio station. You are exactly what they are looking for! 3. Be semi-illiterate: To work in one of the FM stations in Kenya, I am pleased to inform you that you do not need to go to school. High school drop outs are ruling our airwaves and if you are a college dropout, then I must tell you the truth, you are over qualified to work in a local radio station. If you want to be successful in radio, leave school right now. You see, there are two types of radio stations in Kenya, those that employ presenters who can speak English with an accent and those who employ presenters that barely speak English. If you are in the second category, the ones who can barely speak English, I am convinced that one of the FM stations is looking for you. maybe a comedian who can fake a Luo or Luhya accent very well? Or perhaps a comedian with a fake Nigerian accent, name and tasteless Nigerian garb? Or a wannabe comedian that wants to be a comedian but doesn’t know how to? End your search. I am going to give you free career advice. Walk into a radio station and say that you are a comedian who can fake a Luo accent and you will be directed to the human resource office to sign a contract and you will start as soon as you are ready! Njoki Chege, you should learn to use your head in the correct way and not as a rag..
You are as fake as the accents you are talking about.Respect other people's careers dear miss lost..if you didn't make it where they are,just shut the hell up and accept yourself as a failure on that side.. This is garbage.... So what?.